SecureVideo - How do I reschedule, cancel or edit participants for a videoconference session? This article illustrates the process of rescheduling or canceling a SecureVideo session. Schedule Next...: Schedule another session with the same participants and settings. The date will pre-populate as 7 days from the time of this session, but you can change the date and/or time before clicking to Save. 1. 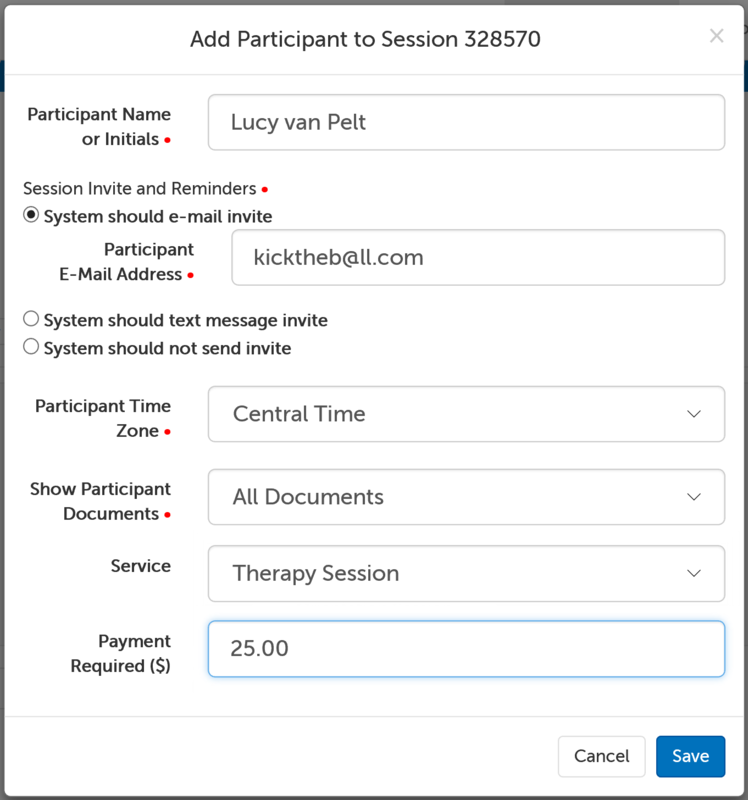 Use the "Add Participant" button (to the right of every scheduled session). 2. Enter the participant's information. Participant Name or Initials: Enter the name of the invitee (minimum of 2 characters). If you have saved this person in your Contacts list, their name should appear as an autofill once you being typing. Participant Time Zone: Choose the time zone your participant is in--this determines the time and date that will be used for their invitation and reminder e-mails or texts (this defaults to the time zone on your account). Show Participant Documents: If you have at least one active E-Document, you will see this question. Select "All Documents" to show all active documents to this participant. Select "No Documents" to NOT show any documents to this participant. If you have created a custom packet, you can select it to show that specific group of documents to this participant. Service: If you have an Account Service set up and have connected a Stripe account to your SecureVideo account, you will also see the ability to associate a service with this participant for this session. Payment Required ($): This field will autopopulate with the selected Service's default payment amount, but you can change this amount. 3. Use the Save button in the lower right-hand corner. 1. Use the "Edit" button underneath the name of the session participant you would like to edit. 4. If you have changed the participant's contact method/information, use the "Remind" button below their name to send a new invite/reminder. 1. Use the "Remove" button underneath the name of the session participant you would like to remove. 2. On the message that appears, use the "Remove" button to confirm you would like to remove this participant. 1. Log into your account on the website. You should have the Scheduler role. 2. Click on the profile icon in the upper-right hand corner, and select Account Users. 3. 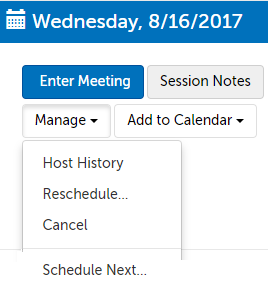 Click on Schedule next to the name of the user you want to schedule on behalf of. This article was last reviewed by our Support team on August 15, 2017.